3 It’s me and my English teacher. 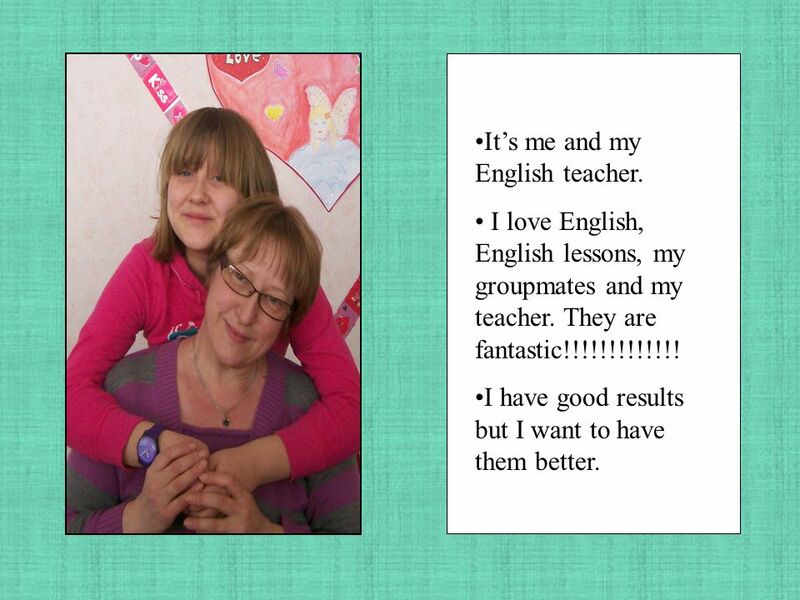 I love English, English lessons, my groupmates and my teacher. They are fantastic!!!!!!!!!!!!! I have good results but I want to have them better. 5 1. Do you try to speak English in the class? A.usually B.never C.sometimes 2. When the teacher says something that you don’t understand, you A.ask the teacher to repeat in your language B.say nothing C.ask another student D.ask the teacher to repeat in English 3. When you come to the class you bring… A.nothing B.your book and a piece of paper C.your book, activity book, notebook and a dictionary 1. A 3 B 0 C 1 2. A 1 B 0 C 1 D3 3. A 0 B 1 C 3 4. 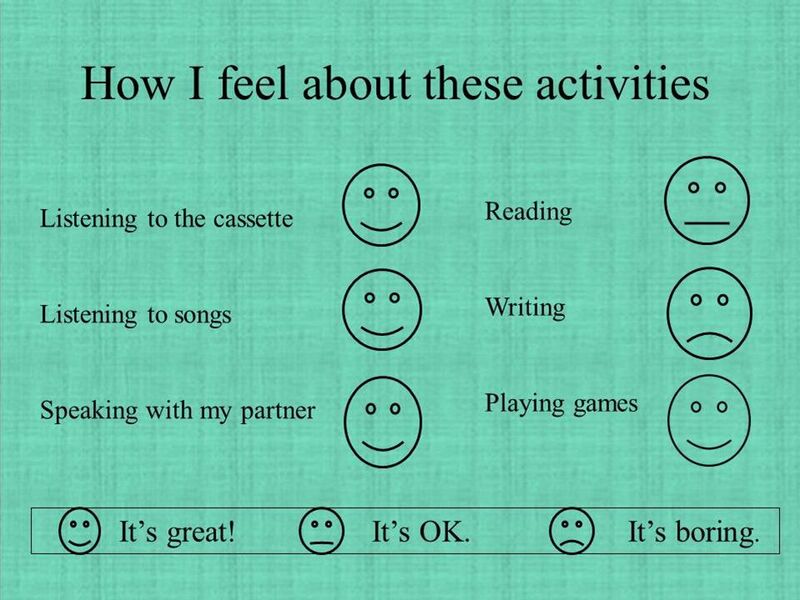 2 points for each answer 13-17 You are an excellent student. You will learn a lot this year. 6-12 You are a good student. 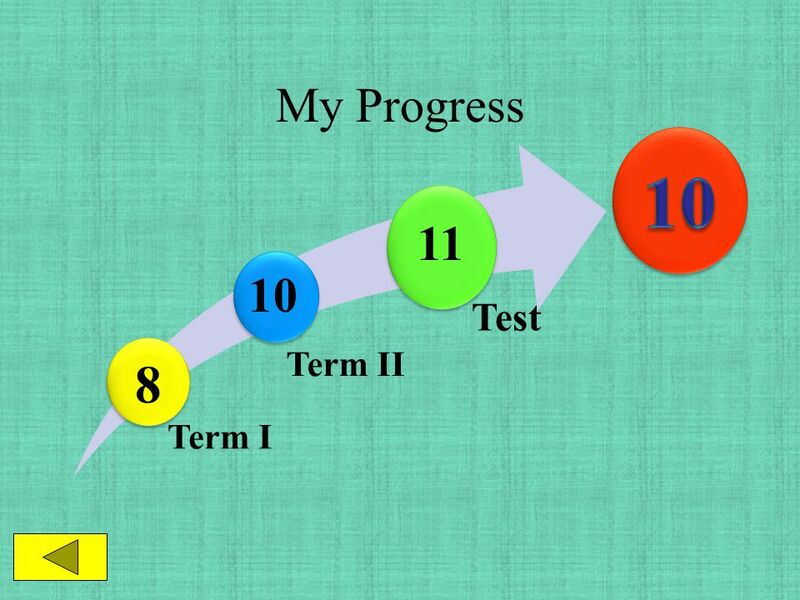 But think about your learning There is still room for improvement 0-5 You are waiting for someone to ‘teach’ you. Remember, it’s you who has to learn! 4. 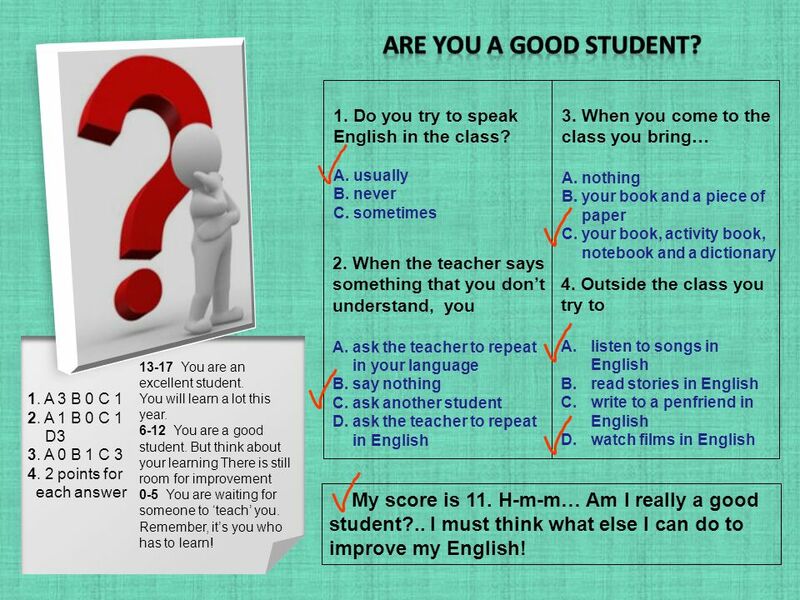 Outside the class you try to A.listen to songs in English B.read stories in English C.write to a penfriend in English D.watch films in English My score is 11. H-m-m… Am I really a good student?.. I must think what else I can do to improve my English! 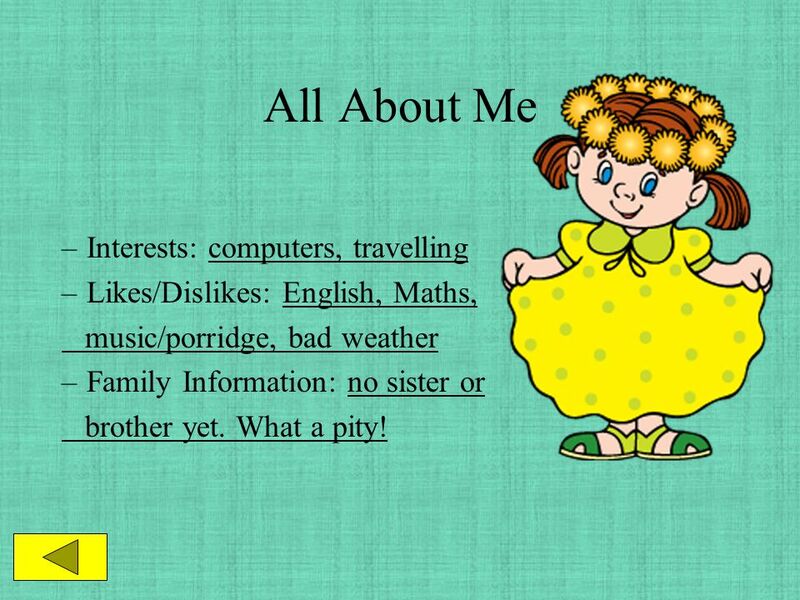 7 All About Me –Interests: computers, travelling –Likes/Dislikes: English, Maths, music/porridge, bad weather –Family Information: no sister or brother yet. What a pity! 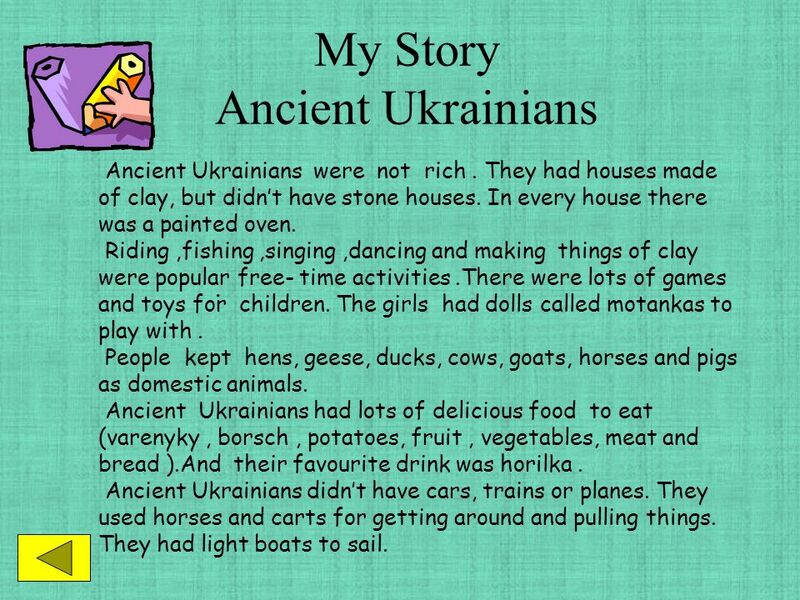 9 My Story Ancient Ukrainians. Ancient Ukrainians were not rich. They had houses made of clay, but didn’t have stone houses. In every house there was a painted oven. Riding,fishing,singing,dancing and making things of clay were popular free- time activities.There were lots of games and toys for children. The girls had dolls called motankas to play with. People kept hens, geese, ducks, cows, goats, horses and pigs as domestic animals. Ancient Ukrainians had lots of delicious food to eat (varenyky, borsch, potatoes, fruit, vegetables, meat and bread ).And their favourite drink was horilka. Ancient Ukrainians didn’t have cars, trains or planes. They used horses and carts for getting around and pulling things. They had light boats to sail. 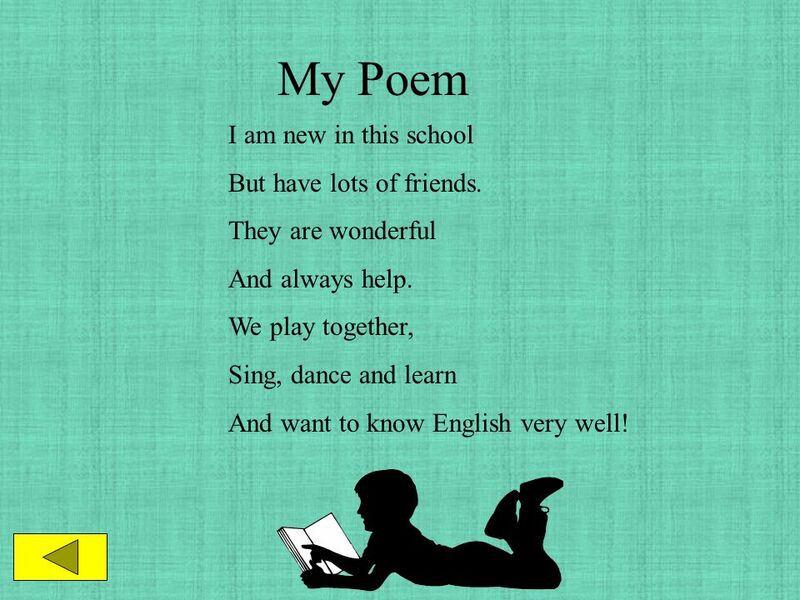 10 My Poem I am new in this school But have lots of friends. They are wonderful And always help. 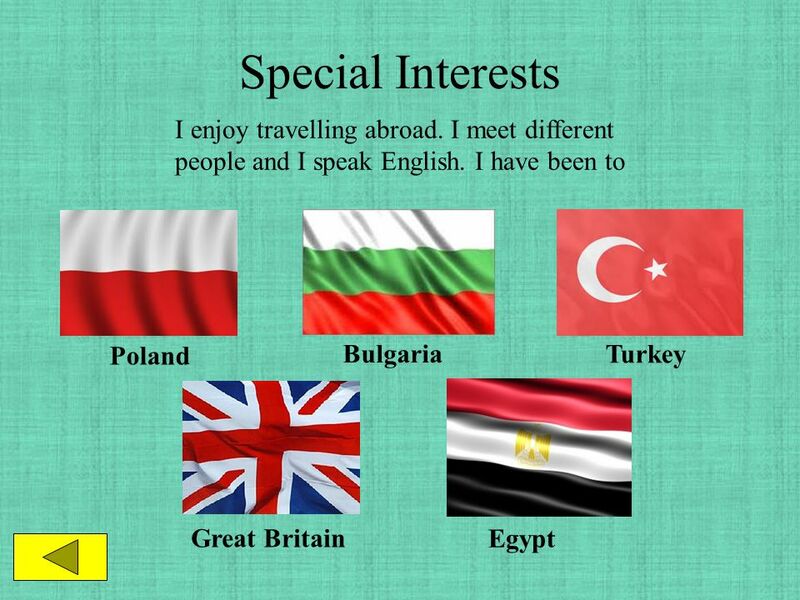 We play together, Sing, dance and learn And want to know English very well! 11 My Handwriting Oops! 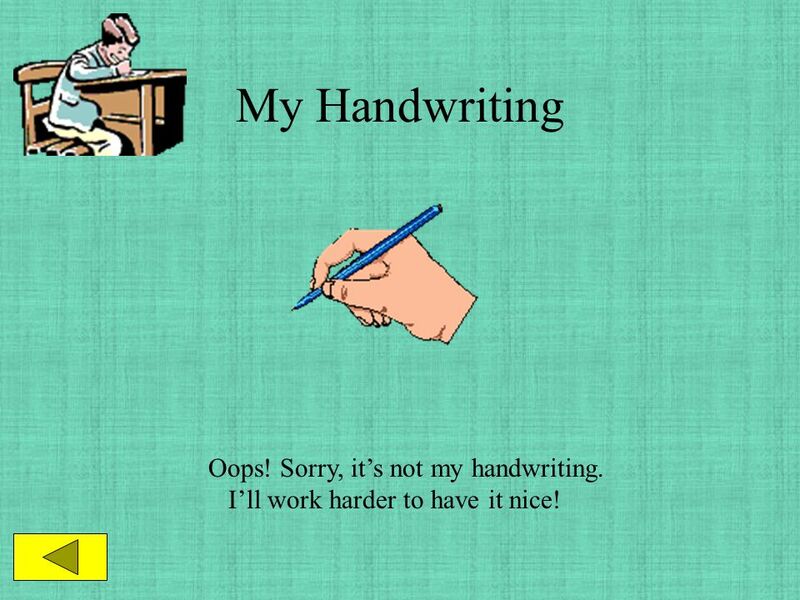 Sorry, it’s not my handwriting. I’ll work harder to have it nice! 13 Speaking. 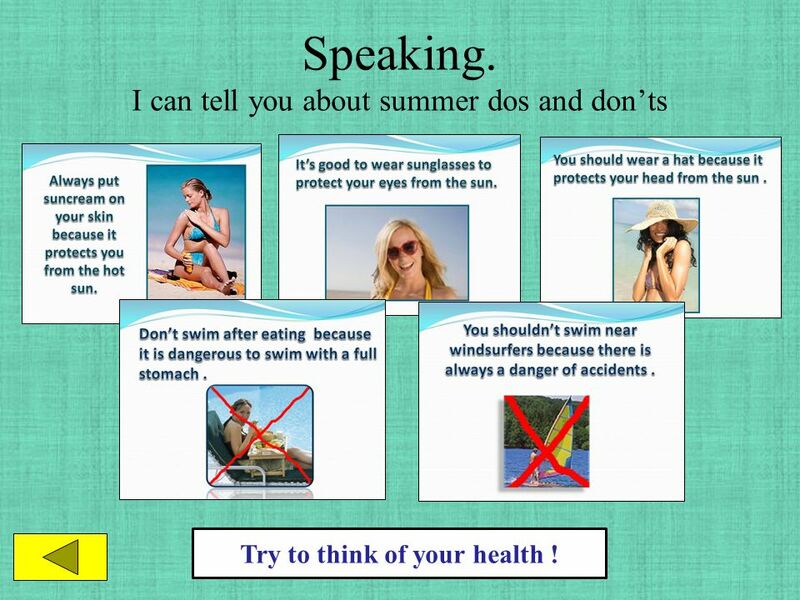 I can tell you about summer dos and don’ts Try to think of your health ! 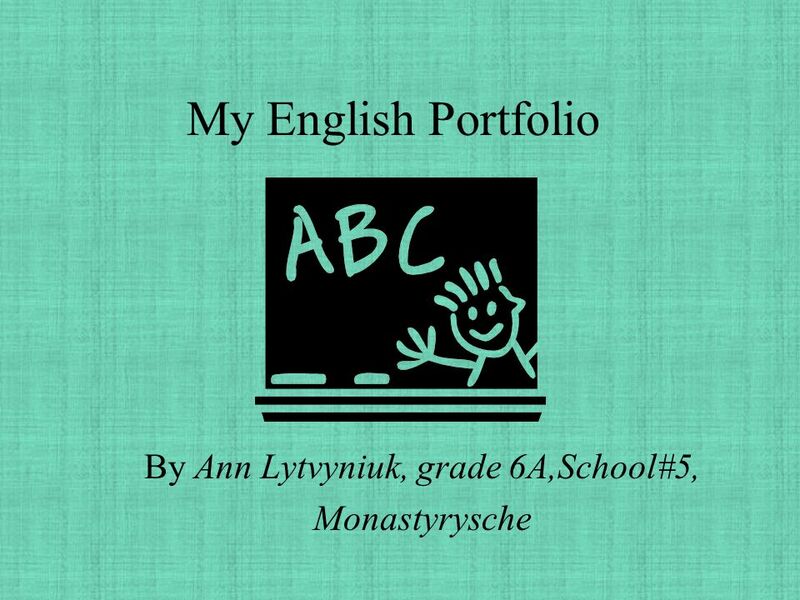 Download ppt "My English Portfolio By Ann Lytvyniuk, grade 6A,School#5, Monastyrysche." Grade 6 Revision 常州市延陵小学 张颖. 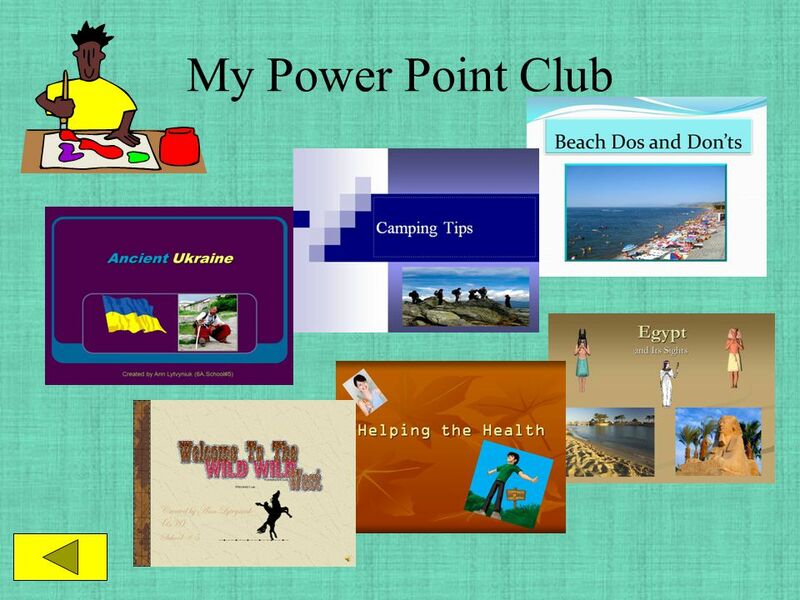 This book is about me My name is ______ This book will help you to get to know me and how I communicate. 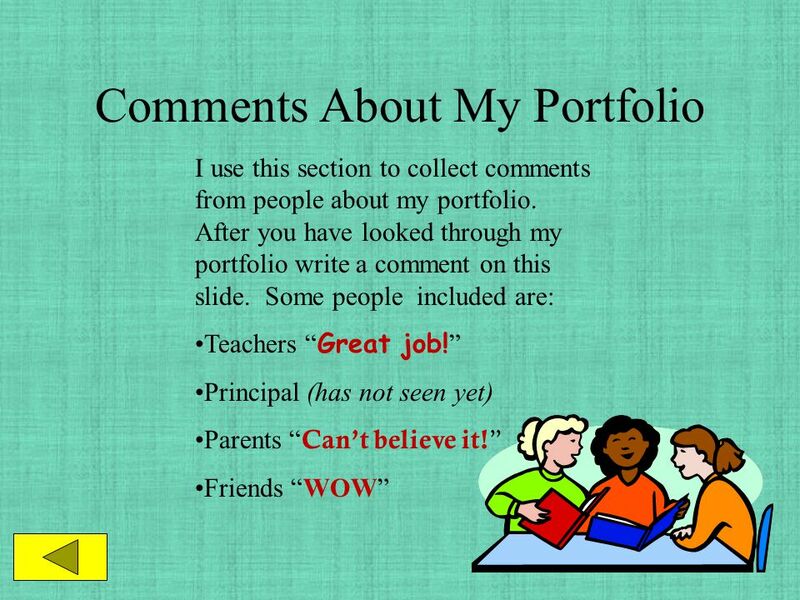 PET for Schools. 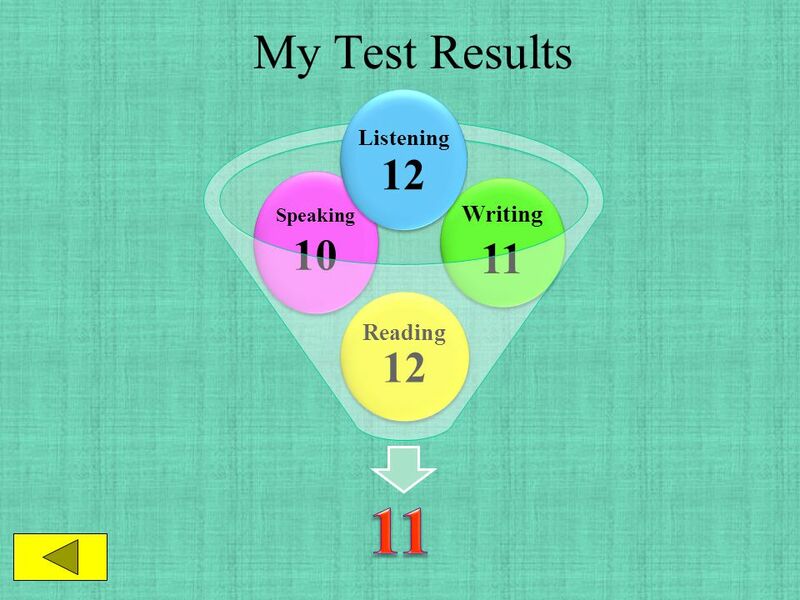 Paper 3: Speaking What’s in the Speaking Test? 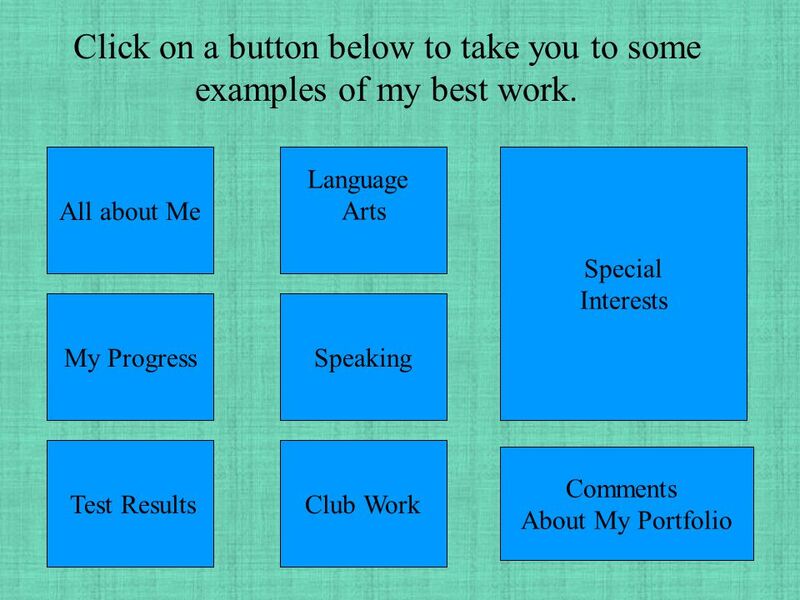 Part 1: You answer the examiner’s questions about yourself and give your opinions. Part.